Understanding and coexisting with Washington's carnivores. The Western Wildlife Outreach (WWO) mission (formerly the Grizzly Bear Outreach Project) is to promote an accurate understanding of Washington and Idaho’s large carnivore heritage through education and community outreach. First implemented in 2002 as a pilot project in Okanogan County (northeastern portion of the Grizzly Bear Recovery Zone) and then later expanded to the west side of the North Cascades in Skagit and Whatcom Counties, the program grew to include all remaining counties within the North Cascades ecosystem in 2006. In 2010, WWO received funding from the U.S. Fish and Wildlife Service to expand their work to include wolves and grizzly bears in the Selkirk Mountain Ecosystem, which includes a portion of eastern Washington and Northern Idaho. In 2011, the program expanded to include cougar and black bear outreach and education, now encompassing four large carnivore species. The main focus of WWO’s work is the dissemination of accurate information about listed species and the recovery process in a non-advocacy environment. The future of these large carnivores rests on human tolerance and safe coexistence. Lack of information, or misinformation, can lead to human attitudes and actions that create barriers to recovery and or healthy sustainable wildlife populations. By providing information, education and outreach, WWO fills important knowledge gaps, dispels misperceptions and helps to change attitudes and behavior in ways that enhance tolerance for, and coexistence with, these remarkable animals. In 2011, WWO Founder and Senior Advisor Chris Morgan debuted his book and accompanying PBS special, "Bears of the Last Frontier." Both chronicle Chris’ journey as he traveled across Alaska by motorcycle documenting North America’s brown (grizzly) bears, black bears, and polar bears. The trip, covering one year and over 4,000 miles of Alaskan territory, details the challenges that come with filming a nature documentary. Chris continues to work with PBS, BBC and the Discovery Channel, most recently on the “Great Bear Stakeout,” and is currently finishing up his feature length documentary, "Bear Trek." The film looks at the wild places where the world’s eight bear species live, through their eyes. Fewer than 20 individual grizzly bears are thought to remain in the North Cascades ecosystem, while black bears currently number approximately 20,000 in Washington state. After an 80 year absence, gray wolves are naturally re-colonizing the state. In 2013, the Washington Department of Fish and Wildlife reported 10 confirmed packs with two suspected packs. While the estimated 2,500 cougars in Washington state are widely distributed, they continue to be one of the most misunderstood of the large carnivores, currently classified as game animals with an open season and license required to hunt them, leading to a declining population in eastern Washington. Brown bears belong to the family Ursidae. 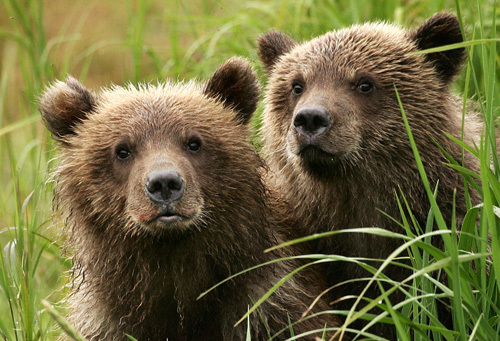 Grizzly bears are a sub-species of brown bear found in North America. The total world population of brown bears is estimated to exceed 200,000, with over half in Russia. U.S. estimates are around 33,000, with most thought to be in Alaska. In North America, the southern fringe has isolated populations ranging in size from over 500 in and around Yellowstone, to approximately 20 in the North Cascades ecosystem. The Western Wildlife Outreach program facilitates Washington carnivore recovery and maintenance by promoting an accurate understanding of bear, wolf and cougar biology, ecology, safety and behavior. The hope is to achieve practical co-existence with carnivores through community involvement and outreach. WWO staff combines expertise and communication strategies with local community and wildlife knowledge suited specifically to the area where the field representatives live and work, allowing them to engage with those at risk of the most impact from carnivores. 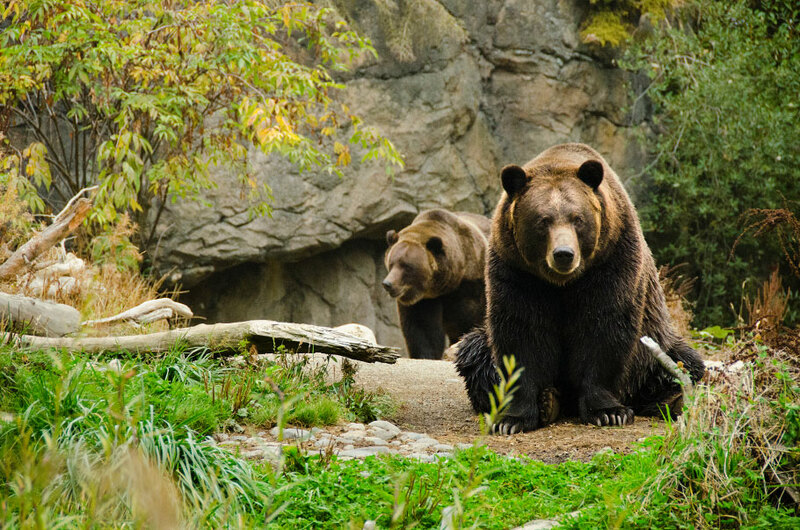 Every year WWO and WPZ team up to offer Bear Affair: Living Northwest Conservation Day, a weekend event at the zoo that shares wolf information and emphasizes safety in bear country to our guests. Demonstrations include turning our bears loose on an improperly prepared faux campsite and birthday party in order to teach our guests how to stay bear safe in their backyards and campsites. With the recent re-colonizing of wolves in the state, information and guest lectures keep visitors apprised of their on-going status as well.